Merry Christmas! Happy New Year! What Will 2015 Bring Us? We’ve seen significant changes to the world of NFA in 2014 and are waiting to see if the ATF will decide regarding potential changes to NFA Gun Trusts in 2015. In the meantime, the NFA Gun Trust is an effective way to acquire and protect your NFA items. The popularity of suppressors, SBRs, and NFA items in general have exploded this year thankfully due to the innovations of manufacturers, expansion of states allowing hunting with suppressors, and the steps the ATF has taken to reduce their backlog. 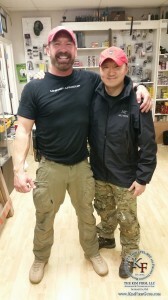 In case you missed it, Jin H. Kim from Kim Firm Guns was proud to work with Craig “Sawman” Sawyer from Tactical Insider, former Navy SEAL, and of History Channel’s TOP SHOT on Sunday Dec 28th at Dixie Ammo Dump in Hoschton, GA. Mr. Sawyer brought his HARD TARGET TRAINING course to Georgia for the first time and was sold out in just a few days! 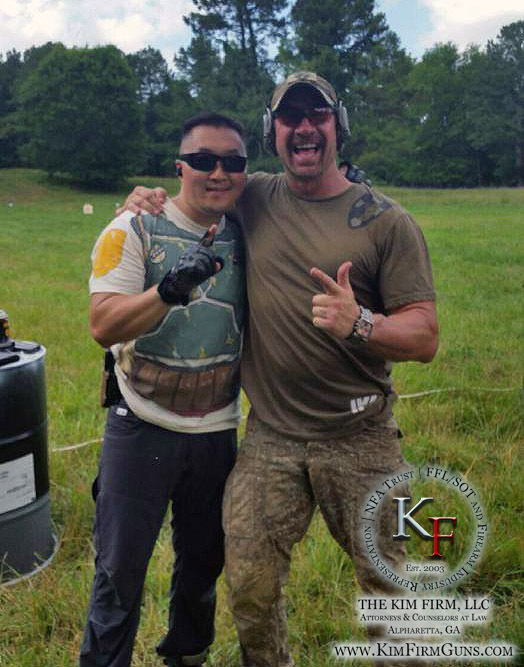 Photos from the class are posted on the Kim Firm Guns Facebook page. We thank everyone who attended and we hope you took something from the course that will help in the defense of yourself or loved one. In a few weeks the 2015 SHOT SHOW in Las Vegas, NV will be in full swing again, Jin H. Kim will be attending the show to see and sample the products and technologies that will inevitably find their way into our personal collection, day job, and battlefield. We at Kim Firm Guns sincerely thank you for your continued support. The future of NFA is bright and we hope you’ll join us to see what 2015 will bring! This entry was posted in Uncategorized on December 29, 2014 by rmuramaru. This is a very hands-on course, you will leave more prepared! Required: Your standard defensive pistol and carbine, minimum 50 pistol rounds, minimum 100 rifle rounds, ear and eye protection. 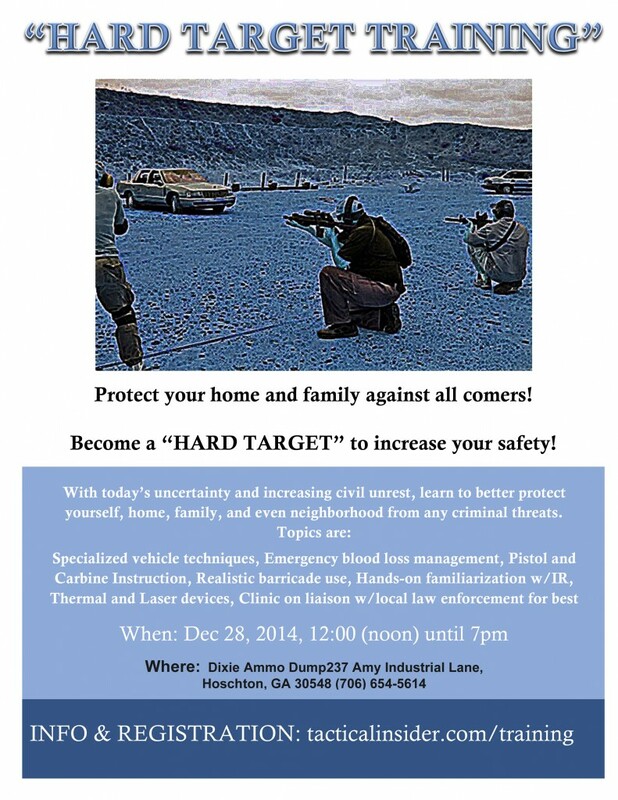 Civilians and non-GA residents welcome. For more information or to enroll please go to or call TacticalInsider.com / (520) 390-2307 or Kim Firm Guns / (678) 990-3038, or use the contact form below. This entry was posted in Uncategorized on December 16, 2014 by rmuramaru. Kim Firm Guns received ATF Form 1 Approval in ONE day?! We held off publishing this post for a few days since we were not quite sure how to report “it.” So we’ll start from the end in order to explain. ATF Form 1 approval in one day! Notice the submission date and approval date are the same in the photo (Dec 2, 2014). Before you get excited, our client did wait the standard ATF processing time, in this instance a relatively quick five weeks, before the ultimate ATF approval. But didn’t I just say it was a same day submission/approval? So how can this be? 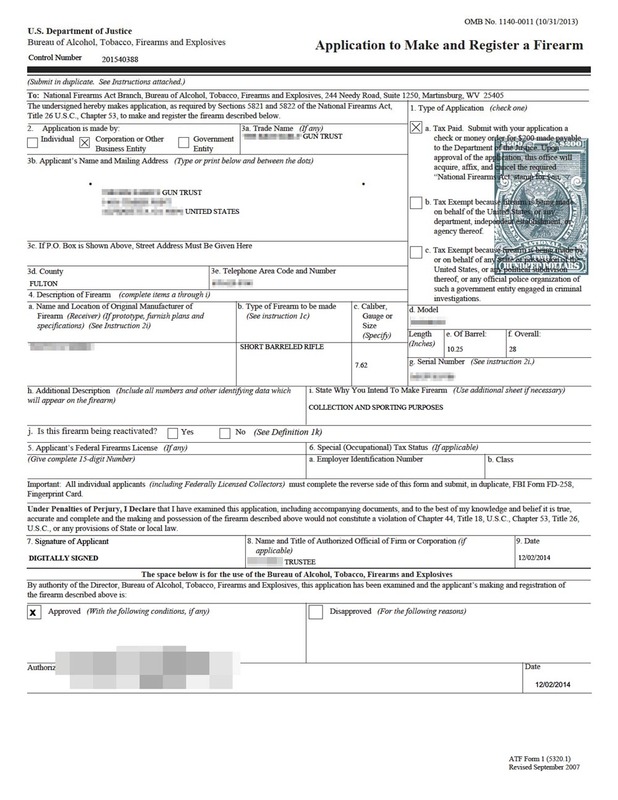 The original ATF Form 1 was electronically submitted in October and returned in DISAPPROVED status on December 1. The Kim Firm reviewed the ATF Form 1 and determined that there was no reason for the Disapproval. The Kim Firm contacted the ATF and the ultimate outcome was a new ATF Form 1 was prepared, re-submitted and APPROVED the same day. Due to attorney-client privilege exact details of how we achieved a single-day approval cannot not be shared. However this example simply highlights major advantages of hiring a qualified attorney who interacts with the ATF in the course of its regular practice to draft the NFA Gun Trust. 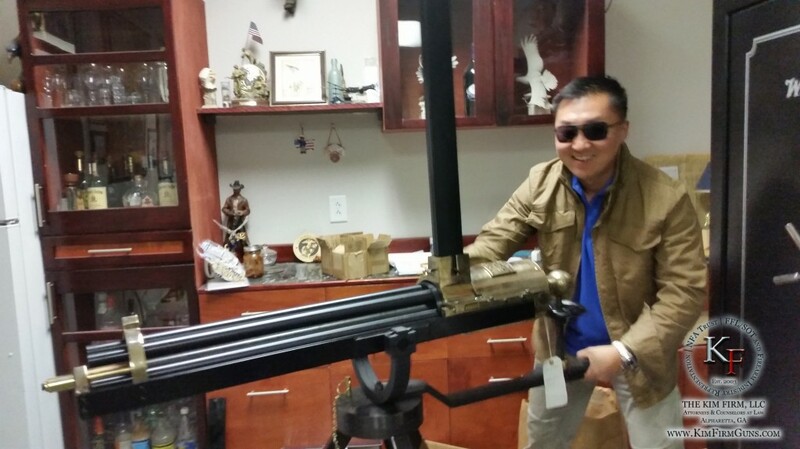 In this instance, it saved the client from waiting for the ATF to process another ATF Form 1. Kim Firm Guns strongly encourages anyone wanting an NFA Gun Trust to research and seek out a qualified attorney so that they may act as your advocate. In this instance The Kim Firm, LLC, experienced in NFA and ATF procedures, turned a potential ten-week or longer problem into a one hour solution. This entry was posted in Uncategorized on December 9, 2014 by rmuramaru.